Hello I am currently in an RN program in Minneapolis and am interested in getting interested in being a traveling nurse. What level of work experience is necessary. I graduate Dec 2012. Most travel nursing positions require a bare minimum of one year of experience. Increasingly, travel nursing agencies are asking for two and even three years of nursing experience. The reason for this is simple. A client facility wants you to be able to “hit the floor” running. They cannot put a lot of time into training a travel nurse who is only commited to a 13 week contract. Founder of TravelnursingUSA.com, Conrad has consulted with many of the major travel nursing agencies and helped more than 20,000 nurses achieve their goal of travel nursing. He is also an author, a photographer hobbyist and world travel enthusiast. Conrad is also the Publisher of “The Weekly 25”, a travel nursing newsletter sent weekly to more then 10,000 subscribers in The United States and Canada. This is great advice. It is important that experience is also in a hospital setting and in the specialty you want to find a travel nursing assignment doing. 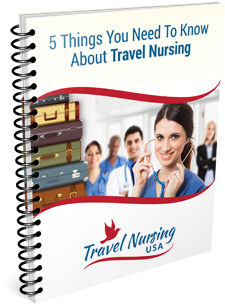 "FIVE THINGS YOU NEED TO KNOW ABOUT TRAVEL NURSING "
Get this BEFORE you talk to an agency about a travel nursing job. We will also subscribe you to our "Weekly Top 25" newsletter listing 25 new jobs each week. Ever Thought About A Side Hustle? Prospective travel nurses can now get information from many different agencies filling out one easy form. Sit back and let them bid for you! It could not be simpler. How about having a relaxed conversation and getting questions answered? If you would like to talk personally with an expert, Conrad will answer your questions. Have a question on travel nursing or advertising? We've been an award winning independent travel nursing website for over ten years. How can we help you? My free email, Weekly Top 25, lists new travel nursing jobs from several different travel nursing agencies. It arrives in your email Inbox once every 7 days.